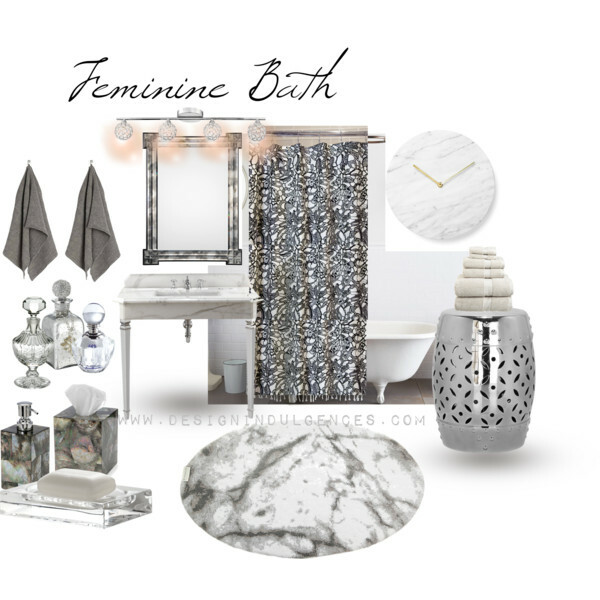 I created a bathroom in a simple white and gray palette with silver and mercury glass accents. I opted for a decorative mirror versus a medicine cabinet. It’s one of the easiest way to update bathroom and something I blogged about here. I wanted shine and a hint of sparkle with classic designs like the floor mat which looks like marble. A pedestal vanity with space to hold some pretty decorative perfume bottles was a must. I can’t stand a pedestal sink that barely has room for anything other than soap. To continue with the feminine vibe I went for a beautiful lace shower curtain. The marble modern clock echos the mat and marble sink. I really like this space. You can find the items I selected for the collage here.